What is common between Karachi 1973, Edgbaston 1987, Karachi 2000 and Abu Dhabi 2015. Well if you want to have a real live stress test, with all its elements, you need to be alive and watching the events happen. I am one of those unfortunate few, who have actually lived and passed this stress test. The commonalities are that its got to be a Pakistan versus England Test Match. The first innings of both teams have to be strong innings. It should be the fifth day of the match. Everyone considers the wicket is lifeless. All think it is a foregone conclusion, that the match is a draw. Pakistan is batting in its second innings (the third of the match, so England have still to play its second innings). Our batsmen and our dressing room is relaxed, maybe too relaxed. They think its a done deal. Except that all hell is about to break lose. Pakistani batsmen will throw away their wickets, in a stupor of carelessness and apparent safety. Then pressure is going to be created and we will end up putting the game squarely in England’s hand and so will have to fight like mad to try and save it. You really don’t believe this do you? But the truth is that this is exactly the way it turns out and we just don’t seem to learn from our history. So to recount. Karachi 1973. With Majid as captain, this match is more famous for the three 99’s which were scored in the match. Majid, Mushtaq and Amiss (https://sarfarazar.wordpress.com/2014/10/26/the-99s-in-karachi/). Going into the fifth day with a 59 run lead and 105 for 2 before lunch, we looked safe. Then we collapsed to 129 for 8. A very brave partnership between Wasim Bari and Sarfaraz Nawaz rescued us and we were able to escape, what looked like certain defeat some hours earlier. The anger all of us felt was utterly useless and all one could do was watch and pray. Edgbaston 1987. Imran as captain. We had just thrashed England at Headingly and for most of the match had looked good in this, which was the forth test of the series. Two big first innings and we were 79-1 at lunch on the 5th day. We seemed comfortable with Shoaib looking excellent. Post lunch we collapsed. Miandad, Malik et al. Imran dug in and resisted. We left England 124 to make in 18 overs. Simple in T20 days, but England with three run-outs squandered their chance and ended up 109 for seven. Phew! The close proximity to a mind blow out. I shall remember that late evening forever. I lost five years somewhere during it. Karachi 2000. Moin Khan as captain. This was the Steve Bucknor match. The chase in the darkness of a Karachi evening. Again we looked okay. Match not in contention. Muhammad Yousuf and Saleem Elahi playing, 128/4. Then we collapsed to 158. Still the target looked unreachable at 176. But we reckoned without Steve Bucknor and his peevishness. He took exception to our slow over rates. So if you are angry, warn the captain. But no, he stretched the game to a time when no one could see the ball. Clearly a flagrant violation of the principle of bad light. England got to 176 in the darkness and Pakistan lost our 45 year old unbeaten record at the National Stadium. Most of our anger was directed at Bucknor. But this disguised the fact that we had lost a drawn match through our own carelessness. Abu Dhabi 2015. Well you do not need details of yesterdays match. Suffice to say, that watching before lunch, I kept thinking of the three matches mentioned above. I promise you, that if I had Waqar’s number, I would have called him up to relate all the above to him. Might have stopped the sorry shots which emanated. Hafeez out to a needless runout. Younus and Misbah to awful heaves, which belie their experience and maturity. Asad Shafiq and Sarfaraz also not really thinking and adjusting for the changing situation. Awful. It was deja vu. A friend of mine shut his television as he could not take the stress. Forty two years and they will not learn. I have come from school to retirement, a whole work-life. But, yet our people do not learn. In the future, I shall personally send this write-up to the Pakistan coach, before the next Pakistan versus England series. Please have a heart and think of us long time supporters. The Karachi test of 1973 arrived and could not have done so sooner. It was the first international match at the National Stadium in over 2 years. 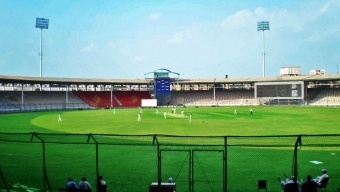 In the previous match of the series, at Niaz Stadium Hyderabad, Greig and Knott had batted almost two sessions to save England on the last day. We all had felt very frustrated to see England escape once more. To us luck was a rare commodity. We had been waiting for victory since Oval 1954. So anticipation was high for the 3rd test of the series. The pitch, as is often the case in Karachi, was bare and dead. One looked at it and said runs. Majid (Captain) sent Pakistan in and Sadiq and Talat gave a good start. Later Majid and Sadiq (89), and then Majid and Mushtaq carried Pakistan to a good score. Those who have followed Majid’s career would know that at crucial stages in his career, his nervousness could be a challenge. Approaching his third century, there should have been no real worries. But clearly there were; nervousness against good line and length bowling, meant Majid went for 99 to Pocock. Innocuous and totally unnecessary! Nevertheless, it was to leave us with a strange record eventually. Later Mushtaq kept piling up the runs and with Intikhab looking good at the other end, Pakistan approached two landmarks simultaneously – 400 team total and Mushtaq’s hundred. Now those who saw Mushtaq play, know he was totally unflappable and the best person around when things looked difficult. But then you reckoned without the Karachi crowd. With the match meandering along and Pakistan looking quite safe on the second afternoon, the crowd decided that it needed to have some fun. Fun meant a lot of noise as the bowler came in to bowl to Mushtaq. Lewis (England Captain) played along with this, seeing an opportunity. So line and length bowling and single saving fields, meant Mushtaq was stuck on 99. Finally, Mushy sent the ball down to mid off and set off, carrying his ample bulk down the pitch in a hurry. In came the throw; off went the bail; a roar and the umpires finger went up simultaneously. The figure of Mushtaq, clearly disgusted, walked back. The picture of Mushy head banging and champing his jaw is vivid in my mind. The crowd at first a bit taken aback was soon laughing and quite chuffed with itself. Surprisingly even Mushy was laughing as he entered the pavilion. Two 99s! Pakistan declared at 445/6 and England’s reply was normal and without problems. However, as Dennis Amiss approached his hundred, a rather bored and slumbering crowd became more vocal. I guess many in the crowd were hoping to repeat their achievement. Amiss obliged, by being tentative in his 90s. Finally he stood on 99. Majid also played along and brought Sarfaraz Nawaz up to forward short-leg. Amiss became even more nervous. You could tell, by the way he paced up and down between balls. Denness, the other batsman, went down and had a word with him. I think it only served to make him more nervous. Next ball an innocuous leg break from Intikhab, which normally could be played down the wicket, was patted into the hands of Sarfaraz. The whole world froze. Amiss, Sarfaraz, Intikhab and the crowd! Then Sarfaraz was leaping up and the umpire’s finger also went up. As Amiss walked back distraught and in shock, the crowd brought the house down. Three 99s! A record; never been repeated. All the three cricketers probably talk about it till today. Years later when I met Majid, I asked him about several things, but never dared ask about his 99. He was also to be bowled around his leg after a beautiful 98, the next year at the Oval. The match itself came to life briefly, around lunch on the last day. Pakistan 105/2, 160+ ahead, suddenly lost focus. In half an hour, post lunch, we collapsed to 129/8 and were looking down the barrel of defeat. Not so! Some beautiful batting by Wasim Bari and Sarfaraz took the score close to 200 and safety. Rightly so, as the test match 40 years ago in Karachi was all about the three 99s, its significance should not be diluted by a result in the match. Forever, I shall picture three great batsmen walking back crestfallen, not knowing, that years later one of their major identities will be the three 99s. Providence works in strange ways! The excitement was supreme….all of 6 years old, dressed in short pants and ready to go. It was my first trip to the National Stadium, to see Pakistan play Australia. This was October 1964, there was no TV in Karachi. So my only experience of watching cricket was to see my cousins play in club cricket. One of them, I am convinced, should have played first class at the least, but then studies got in the way. From memory, I think this was the fourth day of the match. Pakistan had 6 debutants. The old team of the 50’s was destroyed in 1962 by England. It had been a thrashing, accentuated by the bad form of Hanif, the star batsman. Later on it came to light that he had battled through pain in the knee. Nevertheless, the doubts about Hanif remained on his return, after physical rehabilitation. Post the clean out, Hanif had returned, and being by far the most senior and a great student of the game, been made captain. This apparently did not go down well with various regional lobbies in the BCCP and a war ensued. The pressure on the captain was huge. Of the six debutants, two were to disappear quickly, two after few years of mediocrity and two were to last a decade and half. This pair opened the bowling for Pakistan in 1964 and took few wickets. However, they were destined to become iconic Pakistani batsmen in the 70s. I speak of Majid Khan and Asif Iqbal, who batted I think, at number 9 and 10 in the batting order. The openers, both debutants, made a 249 runs stand. Billy Ibadullah scored a century and Abdul Kadir was run out for 95. By the time we reached National Stadium on the 4th day, Pakistan had to score runs to consolidate a small lead and ensure that the Australians were given a substantial target. It was most exhilarating. Thousands jam packed together, like sardines, sitting on steps of concrete, with no shamianas. When a shot was hit, the crowd stood up and a small 6 year old was not destined to see much. The heat – remember October in Karachi – was terrible and my uncle was burnt black. No cold drinks available, toilets non-existent and your back side burnt to boot on the concrete steps. But I do not remember this day for those reasons at all. My memory recalls the roar which went up, when Hanif the Little Master came to the crease. Oh, the excitement and love which was showered on the man. Pakistan had wound itself back into problems. Some 100 plus runs on the board; 4 wickets down; mid way through the 4th day. Burki on the other side and Hanif join’s him. The tension was palpable and the fear was that if Hanif fails, Pakistan will fold. In the first innings we had gone from the heights of 249 for 0 to 300 plus for 7, before Intikhab had saved the day with a quick fire 50. Hanif himself had scored a couple of runs and clearly he was now fighting for survival and captaincy. Not much changes over the decades! A near 100 run stand later, with Hanif standing firm under pressure the day was saved. I remember being totally enamored with this man and a belief was born about Pakistan cricket which has lasted a lifetime. The next 6 months were most prolific for Hanif. A century in New Zealand, another double made in Pakistan and almost another record at Melbourne. 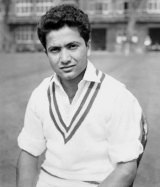 Having scored a century in the first innings, under the watchful eye of Bradman, who expressed admiration, Hanif approached a second century in the match. However, at 93 Jarman made a routine habitual stumping appeal. Much to his horror he saw the finger go up. Jarman apologized, as did the umpire, because Hanif would have had that unique record – eventually Gavaskar did – a century in each innings, twice over. There was just one more day left in this masters career and that came with his 187* at Lords in 1967. But that is another story to tell. Today the original Little Master sits at the ripe old age of 78 in a wheel chair and generally not well, unheralded, an icon of a past age. I would ask you to remember a little man, who stood tall for a decade and a half for Pakistan cricket, when others older and taller used to fall like nine-pins. Had he played today his technique would have made him an icon of this age too. Lord’s, 1982. When Imran Khan threw the ball to Mudassir Nazar, a collective groan went up. England were nine without loss as I watched sitting on the rickety benches positioned on the cover boundary. Sarfaraz Nawaz had gone off from a suspected side strain. Nazar, as he ran into bowl, looked like Shoaib Akhtar from where I was. I saw him bowl, saw the batsman leave and Wasim Bari dive behind the stumps but I didn’t see the ball. Suddenly, England were nine for three – Randall, Alan Lamb and David Gower all back in the hut. Pakistan went onto win that match by 10 wickets. Earlier, in January 1977, the team had to make 32 runs as the whole of Pakistan tuned into proceedings from the Sydney match. There was Majid Khan facing Dennis Lillee. I couldn’t see the ball as Majid was beaten. Sadiq Mohammad and Zaheer Abbas were already dismissed and Lillee had hit Majid on the head. I remember shaking – was it the cold or was it the tension, I didn’t know. Another bouncer, but this time Majid deposited it into the stands. Pakistan won by eight wickets. Things have changed now. Some changes are visible – the advent of Twenty20. But the neutral umpires (you have to watch an Indian umpire in Bangalore 1987 to appreciate that), the helmets and the pitch covers too; the uncultured slash from Virendar Sehwag over third-man or a Shahid Afridi miss-hit for six. When I was in school, I was expelled from the second-XI for lofting the ball twice in an over. I’d spend hours in front of a small radio, tuning into Test Match Special. There were no talks of money, no fixing issues but just pure love for a game of nobility. No endless analysis and, above all, no Facebook or Twitter ‘experts’ sharing their views. The game has moved on a lot from the days when the world was still young. My first experience of National Stadium Karachi was the same as Lord’s: No chairs, just steps and no shamiana cover either. It was tough going. You dare blink risking missing a wicket or a six. But it was spontaneous and passionate. Today we see replays but can’t appreciate the game. The serious spectator has disappeared with the space taken up by the Twenty20 enthusiasts. Even at a run-a-ball required, players and spectators still want to see a slog. The ‘we will make them in singles’ just doesn’t exist anymore. It was a quiet and non-commercial game back in the day, before Kerry that is. With money came great things like affluence, viewership, fairer umpiring, innovation and improved fitness. Experience was made to last and the spectacular became imperative. Pitches were toned down, the game shifted towards batting. Tail-enders started hooking and pulling without fear. Fitness improved careers and ‘gods’ were created, greater than the game itself. Cricket died and was cremated. Now we have less skilled players and, at times, it becomes excruciating to see batsmen not capable of concentrating or being squared up. So while the spectator experience has improved considerably, the quality has gone out of the game. I lament for the game which I loved but there are very few who hear and understand. I was sitting at the PepsiCo office in Zaman Park in Lahore, sometime in 2001, when a note was delivered that a gentleman wished to have a word with me. It seemed a rather unusual method of contact in the times of emails and mobile phones. I nevertheless asked for the visitor to be shown in. The man who walked in was none other than my childhood hero- the revered cricketer, Majid Khan. Most would understand that on such occasions, a feeling of unreality descends. As the hour progressed, he sat and spoke. This would probably be the best description of the encounter, as it wasn’t quite ‘a conversation’. I was propelled through a kaleidoscope of memories which completed a picture of him in my mind. Now all you non-cricketing type, please don’t run away. This is also a human aspect story. My memory of Majid floats back to my being 7 years old and hearing him and Hanif pull Pakistan out of a hole in a test match. Over the next 17 years, one witnessed Majid’s lot rise and then decline, but he would be rated amongst the best, whatever the criterion. Simply put, Majid Khan was a unique batsman, prior to the ‘Viv Richard’ era. He could defy the laws of cricket and construct shots which no book teaches. This was obviously a God gifted talent; he achieved fame as a most unique batsman of high quality, who yet managed to look elegant without following many rules. Unfortunately that is where the script deviates from the story of climbing dizzy heights. Coming from a background of education and culture, his panache on and off the field was visible. Added to it was his stint at Cambridge University. My memory is of him scoring thousands of runs as Combined University Captain. He was an Eastern prince, a throwback to the previous era of Ranjitsinhji. The charm and quality should have led to fulfillment for himself and his nation. Unfortunately that never quite happened. In the early 70s Majid first struggled before he established himself in the team. Some said his temperament was a bit jittery. He then climbed to the role of Pakistan captain and one thought, well, here it comes. Unfortunately, a man of such obvious charisma never was able to lead others and he dropped back to being a player only. He then produced some classic performances over the next years, as if reveling in freedom from responsibility. But, while he won some test matches for us, he failed to lead us to decisive wins in the 2 World Cups and eventually faded from the team in the early 80s. So what exactly happened here? With Majid there was always a melancholy air of aloofness, which try as one may, never went away. Here was a man who thought deep and maybe too hard. In the game of Lords, sometimes plain instinct should have been enough for such a one. He was in his favoured place already, this was his patch. Perhaps his aloofness set him apart from the lesser mortals and was detrimental to the team making culture. His younger cousin, Imran Khan, coming from similar background and personality type, was yet able to wield his assets to the betterment of the team. Probably with less going for him, he achieved what Majid could not. A later stint as Head of PCB in the 90s was largely futile. Post the match fixing scams, Majid and Pakistan crickets value systems were poles apart. He probably felt the whole scenario was too sordid to work with. In the cabinet of Dennis Lillee lies a sunhat, which is soiled and yellowed with age. It was the most famous sunhat in the seventies. It belonged to one Majid Khan. Having worn it for years, Majid bet Lillee that he would not be able to knock this hat off in the 76 tour of Australia. Lillee failed, but managed to hit Majid on the head (no helmets at the time). In deference to this, Majid still gave the hat to Lillee as a gift at the end of the tour. Sitting there listening to Majid, one heard his sad assessment of Pakistan, its cricket, its people and culture. ‘Men of straw’ he said of the people of the subcontinent, quoting another legendary figure from a bygone era. Perhaps his thoughts were going back to his days, when the setup never quite resolved the unease of his presence. Majid himself was from a previous era, which was already dated, by the time he arrived on the scene of international cricket. 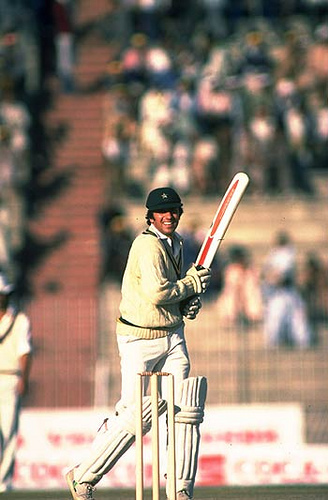 “Sadness under a sunhat” his captain in Glamorgan Tony Lewis called him, when talking of Majid. Perhaps he had hit the nail on its head. There are people who are destined to walk a melancholy road, aloof and untouched. Yet the picture is magical enough for us mere mortals to view and ponder over. A glimpse of what things might have been. Sadness under a sunhat!